Getting ready to work in the garden this summer? 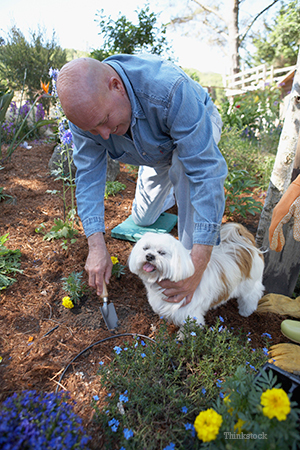 Before you do so, make sure you know about potential garden dangers that can poison your dog. When in doubt, keep your pets inside while working with some of these common garden or yard additives. During the spring and fall, homeowners often use fertilizers to spruce up their lawn. Fertilizers come in two types: granules or water-based products (that are directly sprayed onto the lawn). Fertilizers look scary – they often are applied by lawn services with warning signs stating that children and pets should be kept off the grass for at least 72 hours. In actuality, fertilizers are generally pretty benign; in fact, they typically have a wide margin of safety depending on what type of product is used. Most lawn fertilizers contain natural elements (such as nitrogen, potash and phosphorous) — often represented by numbers such as 10:0:40. Thankfully, these elements are generally non-toxic. Fertilizers may also contain insecticides for killing grubs, snails, etc. that generally result in mild gastrointestinal signs (e.g., drooling, vomiting, diarrhea, etc.) when ingested directly from the bag. If your dog eats some grass that had fertilizer applied to it, it rarely leads to serious poisoning; that said, more serious signs can be seen when the product is directly ingested (i.e., right out of the bag). If ingested directly from the bag, the results can include tremors and seizures. To avoid any poisoning risk to your pet, follow the labeled instructions carefully and keep your pets inside while you apply these products to the lawn. To be safe, keep your pets off the lawn until the product is absorbed by the soil (e.g., when the product dries if it’s a spray-on product, or after it rains if it is a pelleted product). When appropriately applied or diluted, these chemicals typically wash into the soil after rainfall, resulting in low-risk to dogs. Again, these more dangerous types are rarely seen on the market nowadays but, when in doubt, make sure to keep the garage door locked and these fertilizers out of reach! These organic “meals” are widely utilized as soil amendment products, fertilizer components, or as deer, rabbit and wildlife repellants. These products are often highly palatable to dogs; they smell gross, but good to dogs, and so they may tempt a massive ingestion (e.g., dogs ingesting several pounds of bone meal directly out of the bag). Another danger? Gardeners often mix organic fertilizers with other more dangerous fertilizers or chemicals (e.g., organophosphates or carbamates found in some older types of rose fertilizers; spring bulbs; etc. ), resulting in dual poisoning with another product. Rarely, with massive ingestions, “pumping the stomach” (i.e., gastric lavage) may be necessary to get the product out of the stomach. Thankfully, most dogs do well with prompt treatment and supportive care. If you’re about to mulch your yard, pay heed! Most types of mulch are benign, but can result in a foreign body if your dog ingests them. Mulch is typically shredded tree bark, but can also come in different forms (e.g., compost or decaying matter; cocoa mulch; etc.). Cocoa mulch (which is made up from shells or hulls from the cocoa bean) is often used for home landscaping; it’s very fragrant when first placed in the yard, and smells faintly of chocolate. As a result, dogs may be tempted to ingest it. While many Internet sites discuss the dangers of cocoa mulch, it’s relatively rare for dogs to be poisoned by it. That said, there is still a small amount of theobromine (the chemical that results in chocolate poisoning) remaining in the mulch and when ingested in large amounts, this can cause signs of chocolate poisoning. The severity of clinical signs from chocolate poisoning will depend on how much cocoa mulch is ingested; in general, one or two licks or bites will not cause a problem. Regardless, make sure to keep the mulch out of reach of your dog for the first few weeks. Between sun, heat, and rain exposure, the likelihood of poisoning diminishes with time as the smell of chocolate rapidly dissipates. What if my dog was poisoned by mulch or fertilizer? If you suspect that your dog may have been exposed to something poisonous, contact your veterinarian or emergency veterinarian immediately. When in doubt, call ASPCA Animal Poison Control Center at (888) 426-4435. They may be able to instruct you on how to induce vomiting and whether or not there is a poisoning risk. Most importantly, keep your dog safe this summer by keeping these garden and yard poisons out of reach! Lock your garage, keep your dog on a leash or supervised when outside, and make sure to store lawn and garden products in secure containers! Does a dry nose mean your dog's sick?